Standing Rock, water rights, voting rights, mascots and other dominant colonial legacies are being interrupted by Native Americans claiming their own contemporary narratives to counter discrimination and invisibility. 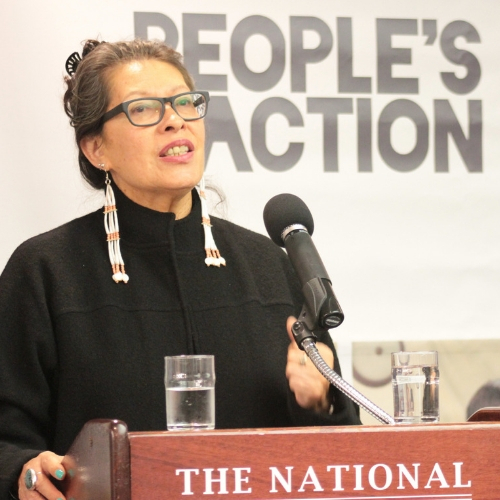 Political power was shifted in 2018 elections where hundreds of Native people, a majority woman, ran for public office. For the first time in U.S. history, two Indian women were elected to the U.S. Congress. Reclaiming narrative is a powerful tool to advance human rights and social justice. The Robert E. Strippel Memorial Continuing Dialogue on Justice and Human Rights is an annual event devoted to the discussion and debate of local, regional, national, and global human rights issues and concerns. Please consider showing support for this fund by giving a gift.